Set a large saucepan over a medium-low heat. Add the pancetta. When its fat starts to melt, increase the heat slightly and fry until it begins to crisp. Strain off the fat and add the olive oil. Reduce the heat and add the onion and garlic. Fry gently for about 5 minutes until soft and golden. Meanwhile, heat the stock to simmering in a separate pan. When the onion is ready, stir in the rice and cook, stirring, for 2 minutes. Mix in the vermouth and simmer briskly until evaporated. Add the bay leaf and a ladleful of hot stock to the rice. Return to a simmer and stir regularly as the liquid is absorbed. Continue the process, adding a ladleful of stock as the last is absorbed. After 10 minutes, stir in the beans. Cook for 8-10 minutes more. 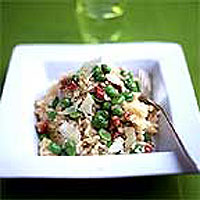 The risotto is ready when the rice grains are separate but tender, with a slight bite. Adjust the seasoning. Serve piping hot with lots of Parmesan.